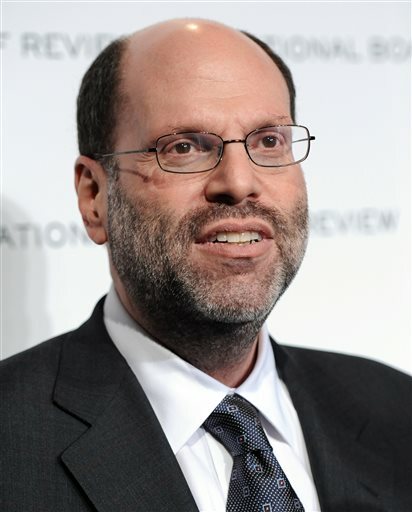 LOS ANGELES (AP) — Oscar-winning producer Scott Rudin apologized Thursday for calling Angelina Jolie a “spoiled brat” and making racially offensive jokes about President Obama’s presumed taste in movies. The comments were made in a series of leaked email exchanges between Rudin and Sony Pictures Entertainment co-chairman Amy Pascal, who also apologized Thursday. It was yet another embarrassment in the ongoing Sony hacking scandal, in which highly sensitive material is being leaked almost daily. “Private emails between friends and colleagues written in haste and without much thought or sensitivity, even when the content of them is meant to be in jest, can result in offense where none was intended,” Rudin said in a statement to industry site Deadline after the Obama remarks surfaced. This latest shocker in the Sony scandal erupted Tuesday, when the website Gawker posted email exchanges stolen from the studio’s computer systems. The leaks gave the public a rare, unfiltered glimpse into the blunt, often crude way Hollywood does business. When juxtaposed with the saccharine graciousness of Hollywood’s awards season, the emails reveal a much darker and, to some, surprising side of the industry. “She’s a camp event and a celebrity and that’s all,” wrote Rudin of Jolie in one exchange about a potential “Cleopatra” project. They continued the email chain joking about which films the President might enjoy, referencing “Lee Daniels’ The Butler,” ”Think Like a Man” and “Ride Along” — all films with primarily African American casts. “I bet he likes Kevin Hart,” wrote Rudin. In a separate email exchange obtained by Gawker, Sony CEO Michael Lyton also called Hart a “whore” for asking to get compensated for promotional tweets. “I look at myself as a brand and because of that, I will never allow myself to be (taken) advantage of,” Hart responded on Instagram. “You can’t hold people responsible on how they conduct (emailing) in private or between colleagues, unless they’re doing something illegal,” comedian Ricky Gervais told the AP. Representatives for Jolie did not immediately respond to the AP’s request for comment, nor did the White House communications office. AP Entertainment Writers Sandy Cohen and Derrik Lang contributed to this report.